The exact time and place where rings first appeared is unknown but it is widely accepted that they evolved from a trapeze-like device that by 1816 featured loops fashioned from knotted rope. What is more certain but poorly understood is that for nearly 150 years the men that worked the rings were in possession of an upper body strength that finds no equal in weightlifting or other calisthenics. 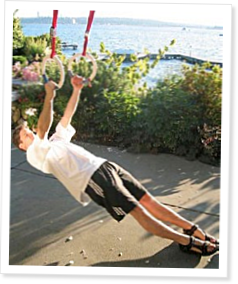 The ringman, pound for pound, presents more upper body strength, along more lines of action, than any other athlete. The fitness that CrossFitters demonstrate cannot be found without ring training. Gymnastics rings occupy a place in our training that only the barbell can match. Kettlebells and dumbbells, medicine balls and stretch bands, while essential to our practice, are second tier tools to the rings.